Every spring since 1995, the city of Nantes has held a classical music festival named La Folle Journée. The festival aims to promote renewed enthusiasm in classical music and make it accessible to a wide audience while maintaining high standards in terms of the line-up. About 300 musicians are expected to participate in the festival this year. On February 2 and 3, under the guidance of Fuad Ibrahimov, Mathilde Calderini (flute) and Izabelle Moretti (harp) will perform at the festival. The concert will feature a concerto by Wolfgang Amadeus Mozart for flute, harp, and orchestra and Symphony No.31, Azertag reported. This year's concept of La Folle Journée is called the "Travel Agenda" because of the compositions of the famous composers during their travels. 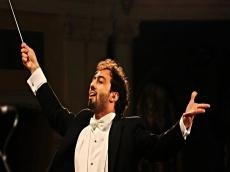 Fuad Ibrahimov is a conductor of the Baku Chamber Music Orchestra and Symphonic Orchestra of Munich New Philharmonic. He took 2nd place at the 6th Evgeny Svetlanov International Conducting Competition held in Paris with the support of Radio France, France musique, L'orchestre philharmonique and the Heydar Aliyev Foundation.